A delicious sponge pudding dessert topped with a little black hat of currants and served with a sauce of your choice. Whisk your eggs, add the sugar and add enough flour to make a thick batter. Add the milk. Add enough to make it look like thick cream. Pour the batter into the pudding bowl. Add the lid or secure a floured cloth over the top with string. Put into a saucepan of boiling water and cook on the stovetop for one hour. Check every 15 minutes or so to make sure there is enough water. Let the pudding cool down completely before removing the lid. 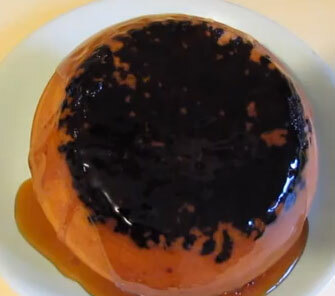 Serve with a sweet sauce or golden syrup.